Literally see parity on disks in RAID5 and RAID6. It often happens that people bring a set of disks from different RAID arrays. Worse yet, a client sometimes says that he or she knows the RAID level for sure while actually it is not so. With ReclaiMe Pro, you can confirm what they say in a couple of minutes. The percentage of even rows (parity) in the full disk set and in every exclusion combinations. 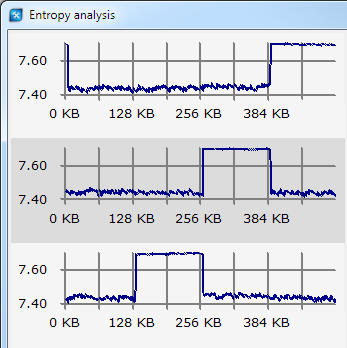 While requiring certain skill to operate, entropy analyzer produces a lot of fancy pictures. As if fancy alone is not enough, these pictures are extremely useful in detecting block size and number of disks in RAID5 and RAID6. For more information, please refer to the RAID analysis overview page.